This is a stunning reverse-on-glass Lager Beer sign manufactured by Wm. J Lemp Brewing Company, circa 1895. This unique Breweriana advertising sign is considered very rare and to date it is the only one known to exist. The oval-shaped sign has a beaming emerald green background behind the glass with a gold underlay that features the name “Lager Beer “. It also has the Lemp St. Louis shield with gold sunburst rays shining around the logo. 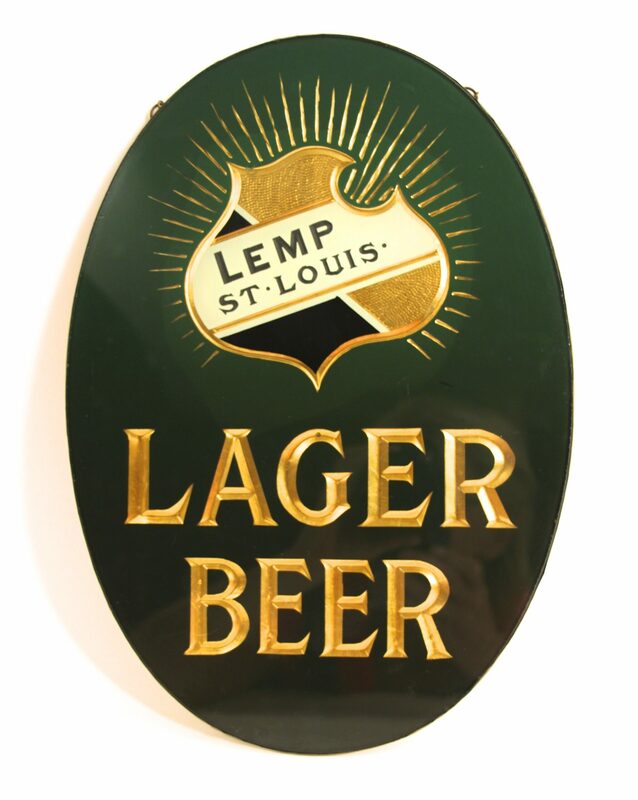 Lemp Brewing Company would use that particular shield logo for many of their reverse-on-glass advertising pieces. The backside of the sign is made of brass and shows the reverse of the design from the front. This is known as the “Reverse-on-Glass” (ROG) process that incorporated putting advertising on the backside of glass. They are considered hard to find and valuable due to the breakage of glass over the years. The paint could peel off of the backside of the glass due to moisture, heat, and many other factors. Many pre-prohibition signs were ROG’s but the process was still popular in the 1930’s-1950s. This rare Lager Beer sign came from a farm sale in rural Missouri. For years it hung in the Shady Rest Hotel in Concordia, Missouri. Only one other Lemp sign somewhat similar to this exists but it is in black Reverse-on-Glass advertised for their “Bottled Beer” . Both the black and the green signs are considered one of a kind known to date. The Lemp Brewing Company was ahead of its time in the mid-1800’s when the business established itself in St. Louis, Missouri. It was the first brewery to use refrigerated train cars and their own railroad line to ship products nationwide. William J. Lemp took over the brewery from his father John Adam Lemp, and both helped grow the company to be successful. By the late 1800’s, it was one of the top 20 largest breweries in America and their Falstaff beer was more popular than ever. 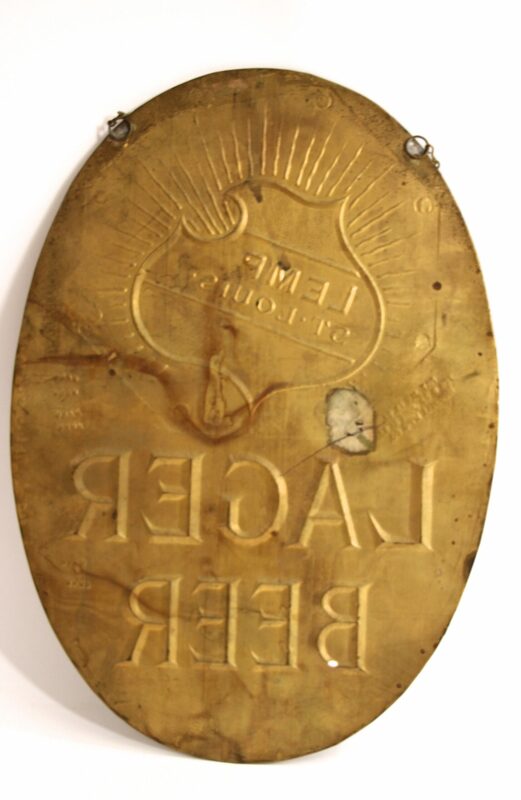 The William J. Lemp Brewing Company produced some amazing antique advertising pieces and today they remain some of the most sought after Breweriana collectibles in the United States.